Our product range includes a wide range of monoaxial screw. Being a quality centric organization, we present an exclusive array of Monoaxial Screw to our clients. Our offered range is widely used for combining bone plates in orthopedic departments. Our entire assortment is passed through a series of tests under the strict supervision of our skilled quality controllers. 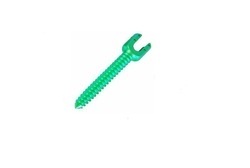 For meeting the variegated demands of our valuable clients, we are offering these screws in various dimensions and sizes at the most affordable price.